Lara and Holly have both being using Bioskin Junior bathtime products for a while as they are incredibly gentle on their super-dry skin. This past month I've had the opportunity to try out a couple of grown-up skincare products for very dry skin by Salcura Bioskin - a daily moisturising serum and a daily cleansing wash. 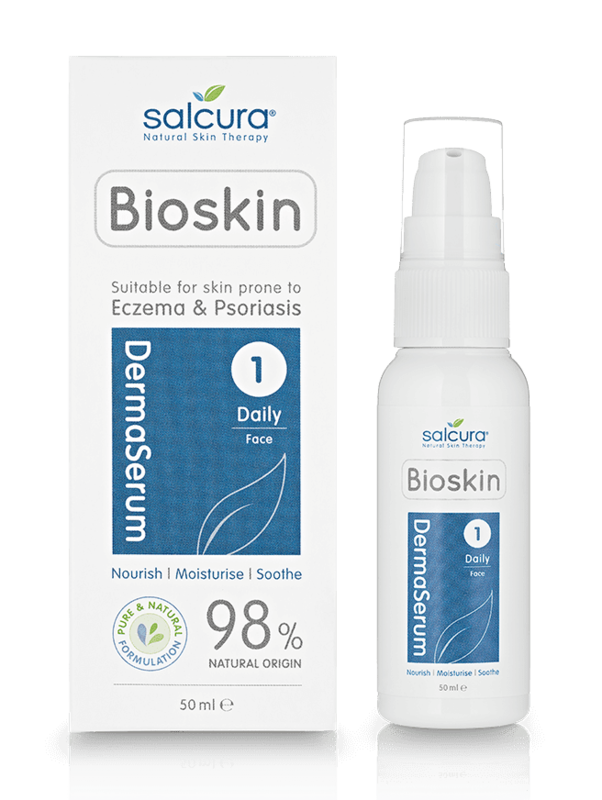 The Salcura Bioskin DermaSerum is made from 98% natural ingredients - it is a light gel-lotion which you apply to your face as a moisturising serum after cleansing. Unlike many thick moisturisers, the DermaSerum is suitable for use on facial skin which suffers from acute dry skin conditions such as eczema, dermatitis and psoriasis. These days, I do still suffer from dry skin (but nowhere near as badly as I did during the first few years of motherhood!) and from occasional stress-induced psoriasis on my body. I normally use a thicker moisuriser on my face but I've been reasonably pleased with the moisturising results when using DermaSerum. I'm actually more impressed with how refreshed and relaxed my skin feels after application. It's almost uplifting! DermaSerum from Salcura Bioskin is great for applying to patches of dry, itchy skin and I can understand how its soothing effect would help prevent itching. I think the relaxing, soothing feeling is intensified by the natural scents from the oils of eucalyptus, tea tree and sea buckthorn. DermaSerum costs £11.99 for a 50ml bottle. Sea Buckthorn is one of the primary ingredients of the Salcura Bioskin facial cleanser, giving it an intense orange colour! This cleanser is a foaming face wash which I have been using in the mornings to wake me up. Often I find that a facewash can leave my face feeling stripped of all its goodness but I think, because this is a largely natural product with a very low level of foaming (due to it having no SLS or parabens), this facewash doesn't have such a strong stripping effect. So, even if you are not a sufferer of dry skin, this facewash is a great alternative to soap. 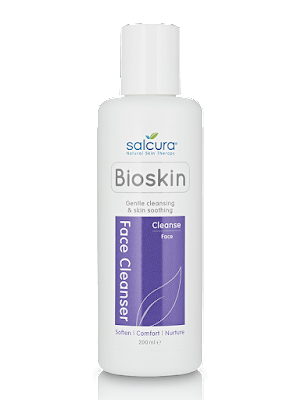 I'm not a big fan of the smell of the sea buckthorn in this cleanser (I know from cookery programmes on TV that its a bit of a love-hate thing) but the scent is certainly very distinctive and Salcura Bioskin products depend upon the skin-healing properties of sea buckthorn berries. I think its a great store-cupboard cleanser for me to use on a daily basis. I can see that, if you are an acute dry skin sufferer, it must be really hard to find a facewash or cleansing lotion that can clean the skin without making the suffering worse. I'd definitely recommend trying this product if you've struggled to find a suitable cleanser in the past. The Bioskin Face Cleanser costs £12.99 for 200ml.